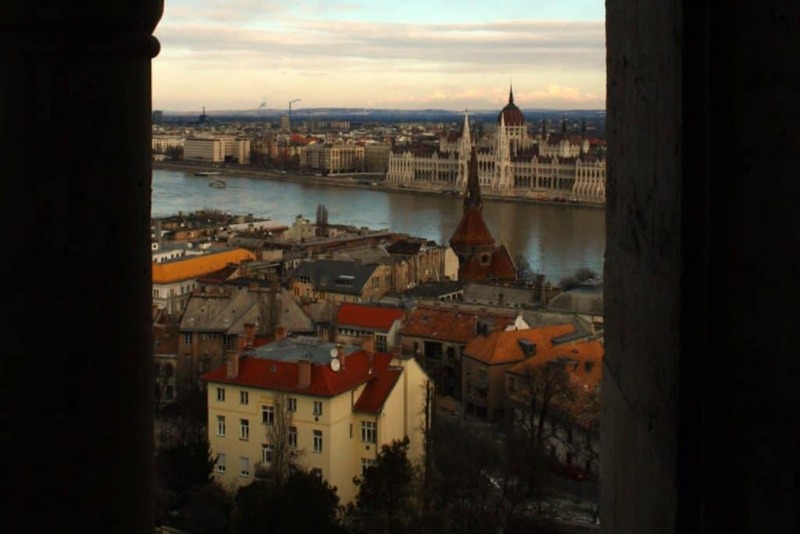 If you’re heading to Europe there is no way you can miss a visit to Budapest. 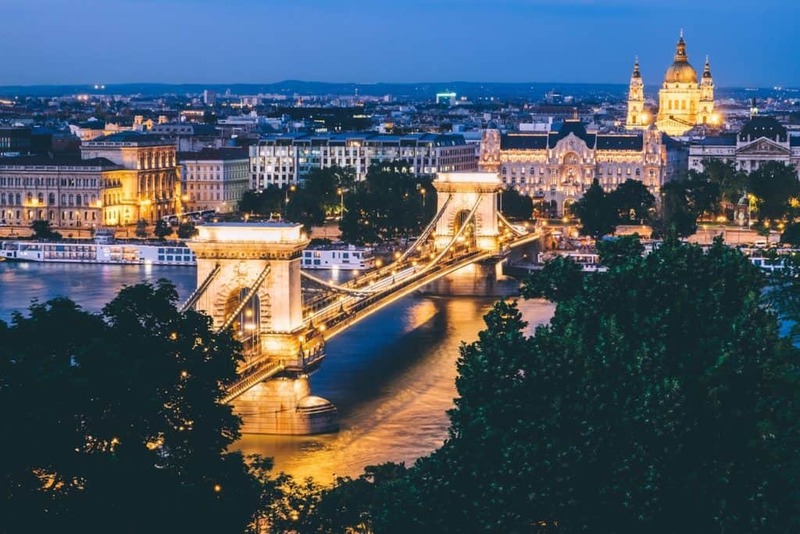 The Hungarian capital is a great destination for culture, food, nightlife, and just about everything else you could look for in a vacation. With so many things to do in Budapest, it can be hard to narrow down an ideal schedule, especially if you are short on time! We’ve spent over two years traveling around all of Europe and believe me when I say that Budapest is amazing! 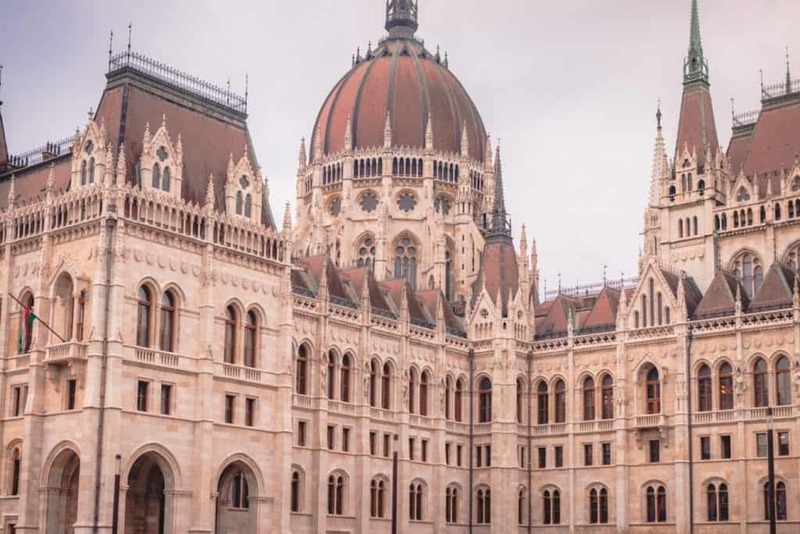 One of Hungary and Budapest’s most revered symbols of national pride and independence, the Hungarian Parliament Building was completed in 1902; nearly 120 years later, it’s still used for its original purpose. It’s an architecturally stunning building, and due to its historical importance, should be one of those things to do in Budapest that you don’t pass up. As if that wasn’t enough reason to visit, you’ll also be able to see the country’s crown jewels and stunning views of the Danube River. Due to its popularity, guided tours fill up fast, so book in advance and during non-peak times if possible. You can book a guided tour here. In many parts of the world, rivers are considered to embody the essence of the countries through which they flow. The Danube River in Hungary is one such river. 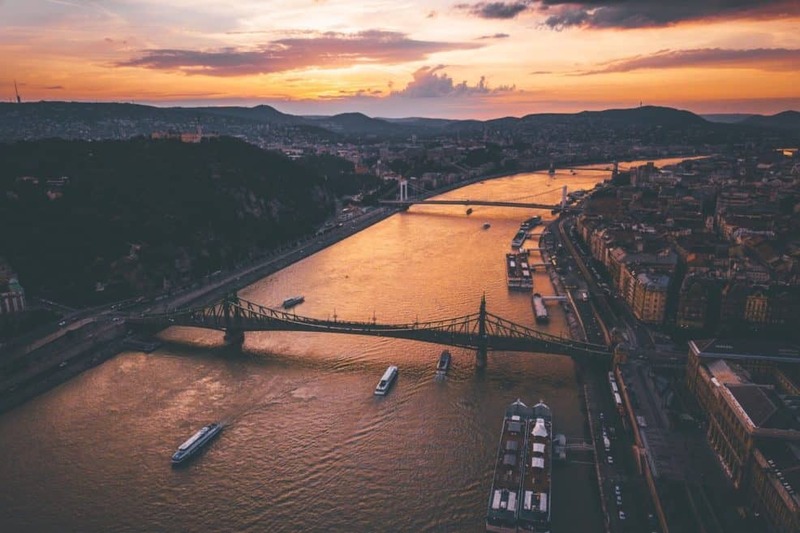 The second-longest river in Europe, the Danube divides the city’s Buda and Pest sides – the two parts that make up the city’s name. There are promenades on which you can walk along the river, and several boat tours too, which will give you special views of the city’s landmarks – many of which are enticingly close to the river. Check out a few of the river cruises here. 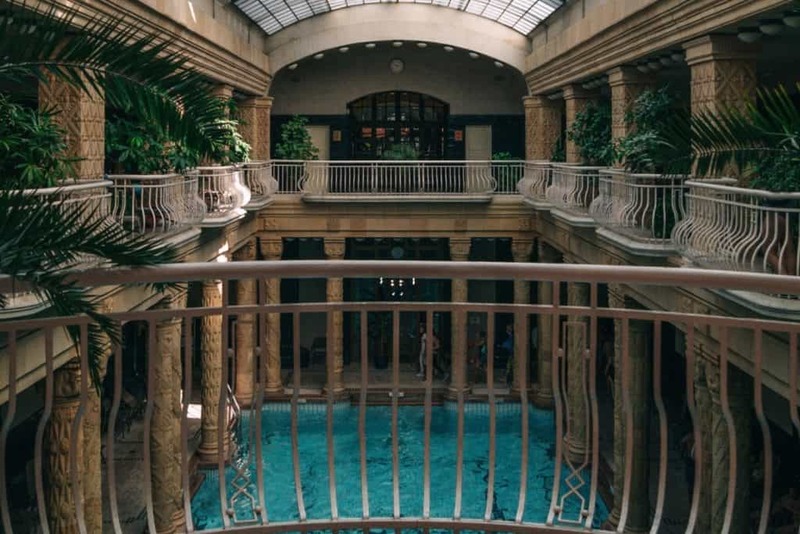 Not surprisingly, Budapest is full of spas and baths; one of the most spectacular bathhouses in Budapest is the Gellert Baths, which is part of the Hotel Gellert in Buda. There, you’ll find an outdoor pool, saunas and ice-cold pools into which you’re supposed to plunge after a stint in the sultry sauna. If money is no object and pampering yourself is the main objective, you might consider a massage or facial to relax those weary bones and open those stubbornly clogged pores. Though nearly 100 years old and damaged during the Second World War, an extensive renovation was completed in 2008, returning the baths to near-original condition. Located next to Matthias Church, Fisherman’s Bastion’s bright white towers make a striking contrast with the sky and surrounding town. The Bastion – or fort – was built in medieval times to protect the town from invasion via the river. The bastion boasts seven lofty and menacing turrets, from which you’ll be able to see magnificent vistas of the city. There’s a fee to enter the topmost portion of the bastion’s turrets, but if you’re on a budget the view from the bottom section is quite good too. A UNESCO World Heritage Site, majestic Castle Hill looms over the scenic Danube River far below. Settled in the 13th Century, the Buda castle was built after a horrific Mongol invasion a century before, making Castle Hill the epicenter of the city’s defense against future raids and invasions. Criss-crossed by a tantalizing web of tiny, ancient streets, it’s a place where you may get lost, in the best possible way. Below the town is a labyrinth of caves and tunnels that have been used for various purposes over the years. You can explore them on your own, but due to their intricate and confusing nature, it’s best to book a guided tour. Along with the Hungarian Parliament Building, Heroes Square is among Budapest’s most honored and visited sites. 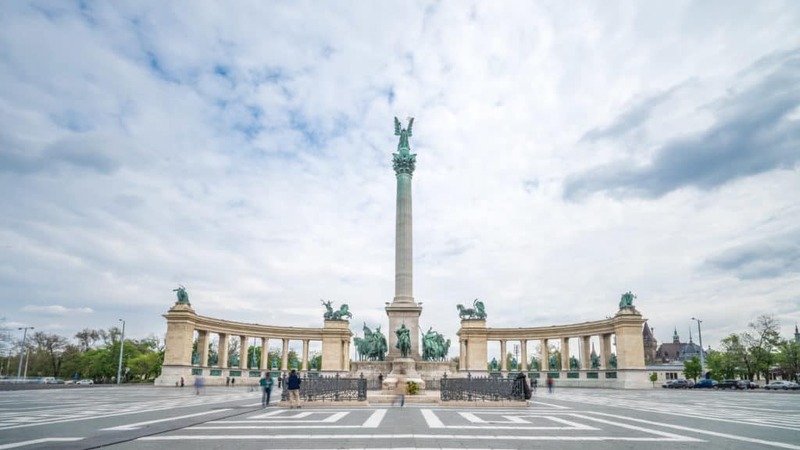 It’s also the largest square in the city and is home to the Millenary Monument, which was built in the late 19th Century to commemorate Hungary’s 1000th anniversary. There are shops and cafes nearby, and, since it’s a public square, it doesn’t close, so feel free to go whenever it’s convenient. It’s also close to a city park and Hungary’s Museum of Fine Arts. 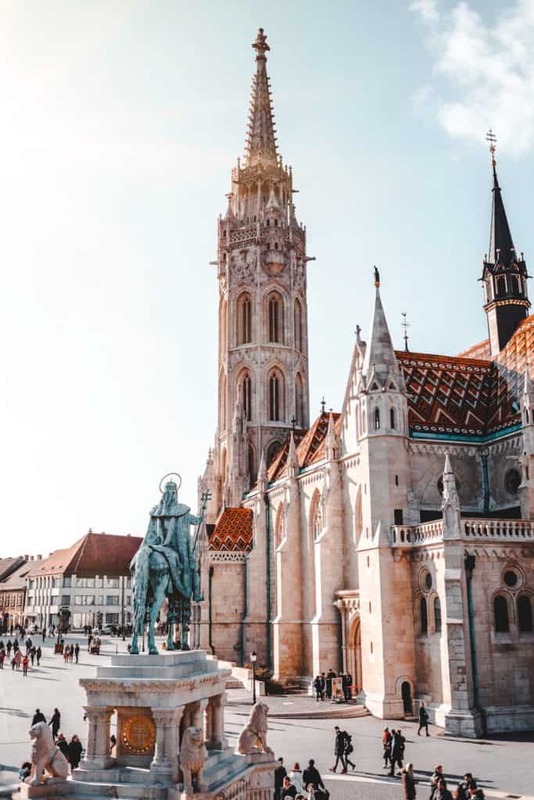 A magnificent Roman-Catholic cathedral built in the honor of Stephen – the first king of Hungary who reigned from 935 to 1038 – Saint Stephen’s Basilica is a must-see. For those who aren’t squeamish and like the odd and eerie, the former king’s shriveled hand is on display here, as a macabre reminder that he was pure and totally free from corruption. Two clock towers and a striking cupola are favorites of those who visit the church, which took nearly 50 years to build and was completed in 1905. It’s one of the things to do in Budapest that you won’t want to skip, and since it’s free and easily accessible, you won’t have any excuses to not go. The easily recognizable and massive showpiece of the aforementioned Castle Hill is the Buda Castle. Heading here is one of the top things to do in Budapest. The once menacing fortress has been turned into a historic site and museum and proudly houses the National Gallery and the Budapest History Museum, both of which are well worth a look when you’re in the area. Due to its prominence over the city, the castle is the perfect place for those who long for romantic vistas overlooking a history-rich country and the scenic river dividing it. The castle is free but there are fees for the museums inside. It’s possible to walk to the top, or for a small price, there’s a funicular that will convey you there and back. Bridges that span nearly 400 meters are hard to miss, so don’t worry about blinking and walking past this magnificent bridge. Pictured above, this bridge built in the 19th Century, most of the bridge was destroyed during the Second World War, though it was rebuilt when the war ended. It’s one of those things to do in Budapest that you’ll tell your jealous friends about when recounting the highlights of your trip. It’s a magnet for photographers looking to capture the bridge’s magnificence, especially at night when the lights create a spectacle with their contrast to the dark sky and Castle Hill. There’s no fee to visit the bridge and you can access each side easily. Resting peacefully in the middle of the Danube River, nearly three kilometers long Margaret Island is an oasis of natural beauty that’s easily accessible. If a long stroll or bike ride is what you’re looking for, this is the place. It’s named after Saint Margaret, the daughter of a 14th-century king who spent her life in a convent on the island. The use of cars on the island is restricted but there are modern running paths. Be sure to visit the Japanese Garden and the Music Fountain, from which water dances, accompanied by classical music, and dancing lights in the evening. Built in the dramatic Romanesque style by King Stephen in 1015, the original church on the site was destroyed by marauding Mongols in the 13th Century. The current Matthias Church was built in the gothic style in the 14th Century. Like many of Budapest’s icons, it’s located in Castle Hill, and like other buildings in Budapest, it changed with the times – being a Christian Church and Mosque as the faith of the country’s rulers changed. Make it a point to visit the art collection housed within, as well as the crypt of King Bella III and his wife Agnes, who ruled in the 10th Century. The church is open to visitors every day but the hours vary. Don’t expect to see a wax rendition of Vincent Price in this House of Terror; the kind of terror to which you’ll be exposed will be all the more frightening because it’s all real. As a monument to the infamous and brutal totalitarian regimes who ruled the country in the 19th and 20th Centuries, the exhibits will give you the chills thinking about the poor souls who withstood imprisonment and torture within its walls. Once the headquarters of the Hungarian State Security Services, you can visit the cells in the building’s basement, where you’ll learn about the ruling regimes and get some firsthand accounts of those who survived unthinkable ordeals here. There aren’t too many places in the world where Christian, Muslim and Jewish history mingle like they do in Budapest. And who would’ve guessed that the largest synagogue in Europe resided in Budapest? If you’re impressed, just wait, because you’ll be even more impressed when you see the synagogue’s dramatic Moorish architecture. During the Second World War, the synagogue was part of the Jewish ghetto in which Jews were forced to live during pro-Nazi rule. There is a museum and memorial garden adjacent to it; it’s open every day but Saturday and religious holidays. Opera isn’t for everybody, but the Hungarian State Opera House isn’t one of the things to do in Budapest that should be on your to-do list. Considered one of the best opera houses in the world, the 1,200-seat facility is built in the neo-Renaissance style and was opened in the late 19th Century. Outside, there are impressive statues of the composer of the Hungarian national anthem, and a famous Hungarian composer as well. You can book a seat for an opera at the box office, or if you’d rather just tour the facility you can do that too. If strange, quirky and unique are your cup of tea, then a visit to Budapest’s Invisible Exhibition won’t disappoint. Created to give people with sight a chance to experience what it’s like to be blind, your legally blind guide will lead you through different environments that most of us lucky people with sight take for granted. Before you’re granted entrance, you’ll be asked to turn off any devices that could cause light, thereby disturbing the tour. After the tour, if your game for another challenge, you’ll be able to eat in the on-site restaurant, which – you guessed it – is totally devoid of light too. It’ll be a fun way to get a good meal and see how good your hand-eye coordination is. The very first thing we did when we arrived to Budapest is head to the famous ruin bars. 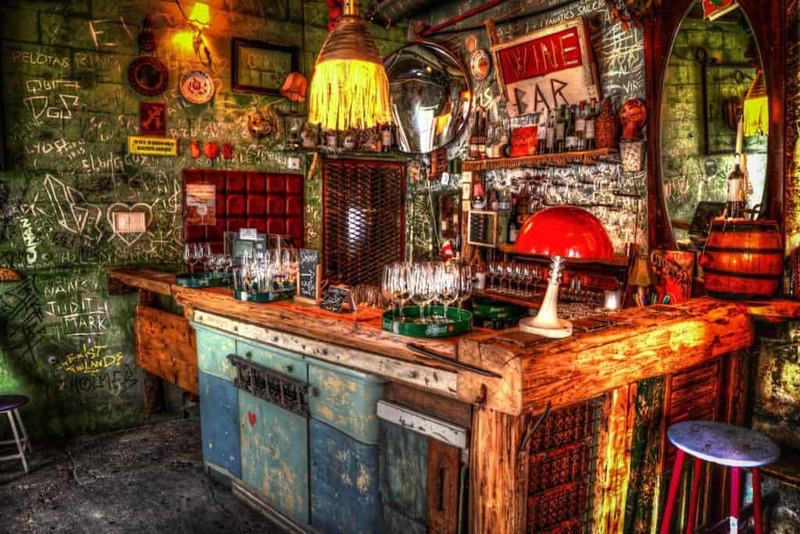 If you ask anyone what the most fun thing to do in Budapest is they will most likely recommend a night out at Szimpla Kert, one of the best clubs in Budapest. Szimpla Kert is a rmkocsma, which translates to “ruin pub” in Hungarian. It’s located in the Jewish Quarter of the city and is inside a dilapidated pre-war building (hence “ruin pub”). A night out here is definitely one thing you can’t miss while in Europe. In a country that isn’t afraid to reveal its troubled past to citizens and tourists, Memento Park is an open-air park where you’ll find dramatic statues of communist and fascist leaders from bygone eras. After the fall of the communist party, most of these statues were removed, but thankfully not destroyed. You’ll see some familiar names that you may not associate with Hungary, like Vladimir Lennon and Carl Marx; during Hungary’s communist rule, these founding fathers of communism were held as icons, at least by those party members who didn’t have much of a choice. The Witness Square portion of the park contains replicas of Joseph Stalin’s boots, to commemorate the destruction of the statue of himself Stalin gave to the Hungarian people in 1956. If finding some knickknacks and souvenirs to remind you of your trip to Budapest has alluded you thus far, head to Ecseri Flea Market. Just outside the city, it’s a place where you’ll probably find what you’re looking for. If your bargaining skills are up to snuff, you may get a good deal too. Feel free to browse through the mounds of items, which will include more than a few things you’re not used to finding in regular stores – like cool commie memorabilia and locally-made toys and candy. Remember that vendors often quote a price for an item that is much higher than what they’re really willing to take for it, so don’t be shy about shooting them a reasonable counteroffer. This is one of the most iconic and elegant places to stay in Budapest. The Corinthia is nearby to the UNESCO-protected Andrassy Avenue and the Oktogon metro station and has a Royal Spa, three restaurants, and beautiful cafe. A great mid-range option is the Prestige Hotel. This hotel is set in a renovated historic building in the city center and just 200 m from the Danube River and 300 m from the Chain Bridge mentioned above. I absolutely love the look of this charming guesthouse. It’s a really great budget option that still has way above average cleanliness, fast WiFi and even free breakfast. Accommodation in Budapest: We like to stay at Airbnb’s when we travel to feel more at home. Here is a coupon for your first stay! Adapter: Remember that Hungary uses the Europlug. Make sure you find a good adapter like the one I have to keep you charged. Otherwise, you may be paying for a cheap one once you land.